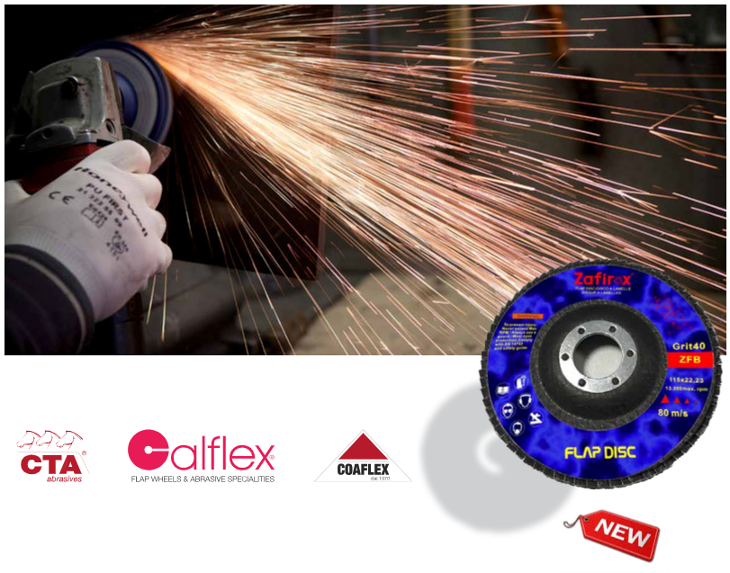 Are you looking for a high performance and affordable flap disc? Here we are with the new Zafirox discs. Zafirox flap discs are characterized by a fiber support that guarantees the total use ofthe disc until the complete exhaustion of the abrasive and ensures maximum resistance even for applications where a high level of removal is required. In particular, the use of Zirconia abrasive ensures that these tools are performing and able to last for a long time during processing, even at high pressures. Zirconium oxide has a particular conformation that causes the abrasive granule to shatter when subjected top rocessing with high pressures, givingrise to new sharp cusps. Thanks to these intrinsic characteristics, the use of zirconium guarantees greater cutting and finishing constancy from the beginning to the end of the working process. The excellent resistance and duration over time, together with the good cutting quality and the progressive consumption for a constant use, make these discs particularly suitable in the field of light metal carpentry, for deburring stainless steel, hard alloys and for applications on iron and steel. Zafirox flap discs are currently available in 115 mm diameter, flat and conical shapes, in the most commonly used grits: P40, P60, P120. All CTA Calflex articles are manufactured according to the strictest European safety regulations and the highest quality standards. A promotional price is provided for minimum quantities of 120pcs.